Today we’ve a very special review for you here at Metal Nexus which concerns a group that are more-than-likely virtually unknown to the vast majority of our most avid readers at this precise point in time but are more than certain to achieve high bursts of success and international acclaim in the years to come. 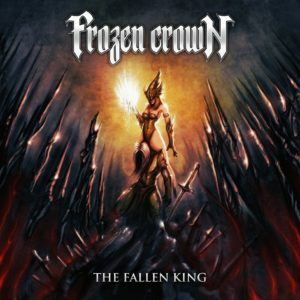 Frozen Crown aren’t a name you’ve heard before but will most definitely hear a lot more of very soon. They are a self-categorized ‘Melodic Power Metal’ group that fuses high imagery, orchestral textures, operatic vocals and storming rates of velocity. The group consists of chief songwriter Federico Mondelli (Be The Wolf) on guitars, vocals and keyboards alongside frontwoman Giada Etro (Ashes You Leave, Tystnaden). Completing the ensemble is the miraculously gifted seventeen-year old female guitarist Talia Bellazecca, bass guitarist Filippo Zavattari and high-voltage drummer Alberto Mezzanotte. Their debut album ‘The Fallen King’ is scheduled for release via Scarlet Records on 9 February 2018 and will no doubt be of interest to huge devotees of up-and-coming metal acts but it is also more than likely to raise eyebrows from those whose interest in such blossoming movements would have previously been very minimal. Starting with a figurative bang, ‘Fail No More’ is an unstoppable force of energy, speed and rhythmic precision. It’s exactly what I myself personally find entrancing in groups such as themselves but they manage to pull it off better than the vast majority. Symphonic keyboard lines are prevalent yet the group are firm to assert such instrumentation is only utilized for the purpose of versatility and coloration. The perennially smooth interplay between the two vocalists is a pivotal factor to the group’s identity and offers a real sense of complementation to themselves respectively and of course the supporting musicians. It also becomes very clear even at the brink of this first track that the group are keen to exercise their technicality muscles with a wide range of guitar-playing styles showcased here. ‘To Infinity’ is a much-needed contrast from the speed of the previous track and is a very lovely mid-tempo track at the basis of its heart. The song is highly sensitive in nature with its delicate interplay of harmonic invention. Keyboard lines here are a tad less bombastic and more organic, too. The chorus is memorable as always and the track implants itself in the brain very quickly after its cessation; particularly as there’s a very sophisticated key-change towards the end to emphasise the triumphant nature of the song and it really gives the whole album a “lift”, psychologically speaking. ‘Kings’, as expected, regains the pace yet again and it really impressed me as to how structurally-conscious the group are in terms of arranging the track listing. I could foresee what was coming each time and I found that really impressive as many groups tend to get the balance wrong. I’d say it takes a longer time to settle in to itself in comparison to the other songs but that certainly doesn’t render it as “weak”, – it’s just not as immediate due to its lack of a major hook. ‘I Am The Tyrant’ begins as an electronic-driven spiralling of melodies before it slots itself into the now-quintessential sound of the band. There’s sections of the track which are in 3/4, vocal-harmonization is at its ubiquitous peak here and there’s even some growling moments, too, which is an interesting inclusion as there’s moments of this particular track where you hear the group at their most “mellow”, comparatively. If this were in conventional record format I’d view ‘The Shieldmaiden’ as the appropriate closing-track for Side One. It is the longest track of the ten and is, much akin to the previous track, very keyboard-driven at the beginning before it bursts into excursions of fast verses, occasional growling vocals and the like. Towards the end there’s a lovely odd-time signature thing which I myself found difficult to decipher, – it may very be well in 4/4 but they manage to disguise it very well with unorthodox accentuations. The track ends on a rather pessimistic chord which would summon just about anybody to flip the record over..
Be sure to check out their Facebook page for more updates! 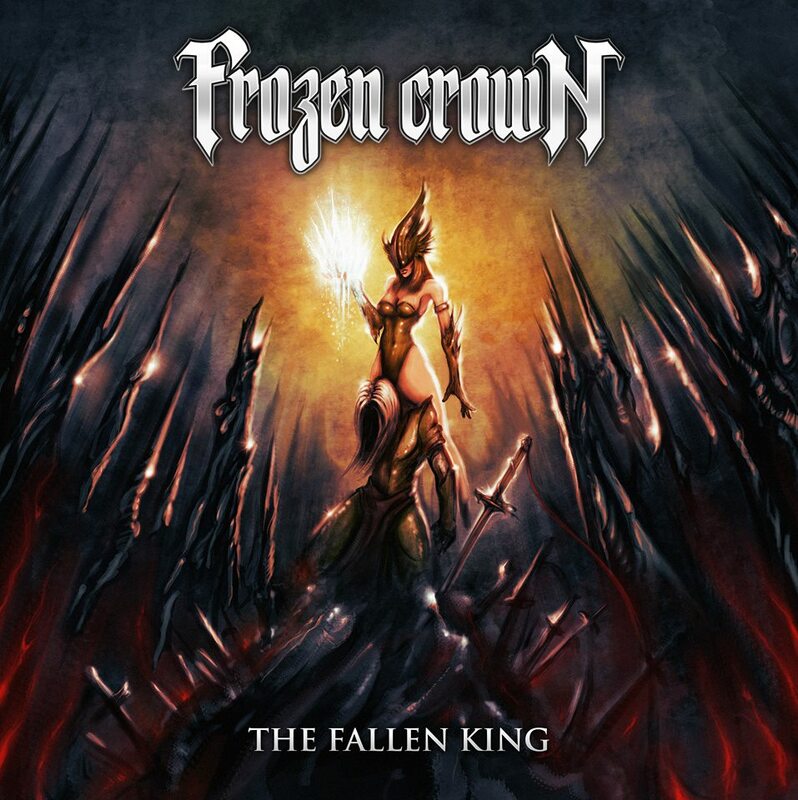 Tagged 2017, frozen crown, Power Metal, Symphonic Power Metal, the fallen king. Bookmark the permalink.